» Why thwart state dispensary law? Why thwart state dispensary law? 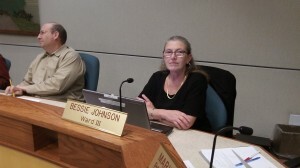 Councilwoman Bessie Johnson has been pushing to keep pot dispensaries out. A majority of the Albany City Council seems determined to keep illegal marijuana growers in business. How else to explain their effort to circumvent the state law that is intended to allow medical marijuana dispensaries to operate under strict state supervision with a long list of safeguards against abuse? Four city council members (Rich Kellum, Floyd Collins, Bill Coburn and Bessie Johnson) voted on Dec. 11 to direct the city staff to draft and initiate a change in land use regulations that would have the effect of barring dispensaries regardless of the state rules. Albany’s proposed code amendment would bar any land use where drugs illegal under state or federal law are transferred. Even though medical marijuana has been legal in Oregon for years, the federal government still considers it illegal. In Oregon, though, it’s not enforcing the federal ban. Law enforcement officials have recently warned against dispensaries. For years they’ve been opposed to legalized medical marijuana too, but on that issue the voters and the legislature have overruled them — or so one would have thought. A number of cities now want to exempt themselves from the law, and Albany may become one of those. Not only would this thwart the good intent of the (law), our city council representatives will see a boom in illegal trafficking of marijuana. Why does this have to be “defy the state” or “promote pot use”? There is a third option: create a new business license for dispensaries with rigid guidelines and an associated fee. Why is the city willing to go through the exhaustive process of enacting a completely new, completely unnecessary zoning use ordinance? How much more money is the city going to waste on this issue, opposed to actually making some money. As an aside, take a look at a city map. If the city of Albany bars dispensaries in the city, a 3-minute drive from anywhere in the city puts you outside city limits. This ordinance will NOT stop dispensaries around Albany and it will draw legal challenge, guaranteed. Bessie Johnson has an axe to grind entirely based on ignorance. She has refused multiple attempts to meet with her and give her information about dispensaries, choosing instead to continue to foster an attitude of moral certainty. The bottom line here is that people simply don’t understand what dispensaries are/should be. People read reports of illegal growers/distributors getting busted and they have a knee-jerk reaction. What they don’t realize is that the people that get busted are not representative of the OVERWHELMING majority of medical marijuana patients. Hence WHY THEY GET ARRESTED. It’s ludicrous to say that because I drive a Toyota Highlander SUV and there have been people in the past who purposefully drive recklessly in Highlanders, I, therefore, drive recklessly. What happened to personal responsibility? Maybe this should be the first step to creating a “dry” Albany? If the city council passes this ordinance, it is going to cost the city THOUSANDS in legal fees, and would seem to be a first step to legislating based on Bessie Johnson’s morality and not on actual needs of the citizenry or on actual facts and evidence. If you are in Ms. Johnson’s district, please give her a call and ask her straight out what a dispensary is. I’d bet my medicine she can’t, won’t, or is wrong with her answer. Is this how Albany wants to be governed?